PeaZip is a free compressor and decompressor that well known for easy to use, fast decompression and variety of functions, not to name that more than 100 formats supported. 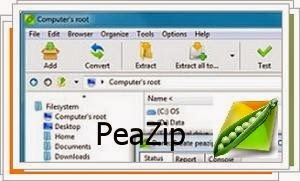 The ability to open, view and extract archives, PeaZip adds the creation of self-extracting archives and compressed files with password, splitting and joining and converting to another format so that it occupies less space and is more secure. PeaZip is also integrated into the context menu, so you can unzip a file or take any other action with the right mouse button. You decide what options to show and what not. And the last, PeaZip allows you to find the name of a file on the Internet using one of the many search engines that integrates.